Published by Gallic Books in 2009. French Translation. Pierre Arthens is France's greatest food critic and he is on is deathbed. He cannot die until he stops being tormented by his inability to remember the most delicious thing he has ever eaten throughout his lifetime. He spends his last hours looking back over his life, to try and discover when he ate that elusive meal. In between each chapter about food, the people that have surrounded Pierre through out his life, share their thoughts and feeling on his life and his inability to love his family in the same way he loves food. This book should definitely come with a public health warning. It should not be read by anyone about to begin a diet or in the midst of a diet, as it will seriously damage your willpower. I began this book, during the second week of my perpetual diet and could not devour a chapter without a glass of white wine and a chocolate truffle. 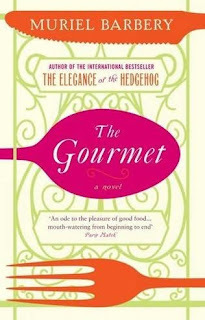 With each paragraph I read, my mouth began salivating; with each vivid description of different meals, my mouth went into overdrive, easily imagining each meal described. Every thing is described with such detail, the words just flow off the pages. This book tantalizes all of your senses, from touch through to taste. It will remind you of times gone by, when you first ate certain types of food and who you were with at at the time. If I could have put this book between two slices of bread, with a little butter and eaten it, I would have. It was simply divine. 'In bread one can find dazzling variety, akin to a miniature world, which reveals its inner workings as it is consumed. You storm it through an initial encounter withe the barrier of crust, then yield to wonder the moment you are through, as the fresh soft interior contents.There is such divide between the crunchy shell - on occasion as hard as stone, at other times mere show, quickly yielding to the charge - and the tenderness of the inner substance, which lodges in one's cheeks with a docile charm, that one is almost at a loss'. This book was absolutely amazing and draws you in from the first page. You cannot help but feel pity for Pierre, that he never found it in his heart to love his family as passionately as he loved food. He knew more about food than he did his own children. Even to the end, he never rectifies the broken relationships, yet they all feel such love for him, even though he never showed it back. I got the impression that he never really cared what others thought of him, they were insignificant to his life, where as to them, his tendency for coldness, left them with a gaping hole in their hearts. This book is a very quick read and can easily be digested in one sitting. If you are a lover of food, then you really must read this one. This will make you nostalgic for the most fabulous meals of your lifetime. I wonder if you can remember the most beautiful thing you have ever eaten in your life. The one food and memory that will stay with you forever. The one item of food that can still make your mouth water years after eating it. The one where you can imagine it instantly and almost taste it. The most wonderful food I vividly remember eating and never having since, was Angels on Horseback, in a restaurant in Hampstead Heath. I was about 20 years old, earning good money as a waitress,whilst studying for my degree and thinking I was pretty sophisticated. I went to a restaurant with some friends and ordered this starter off the menu and fell in love. Angels in Horseback are oysters wrapped in bacon and to this day I have never attempted to cook them just in case they don't taste the same. So that is my most wonderful food memory, a meal I still crave nearly twenty years later. What meal do you remember purely for the taste? Wow, Vivienne. How can I not want to read this book after that review?! I've never heard of oysters in bacon, and to be honest, I can't remember the best food I've ever tasted. BUT I do love reading about food for some reason, and this sounds great! I really can't think of a meal that stands out for me like that, but the book does sound good to me! Sweetbreads with an amazing reduction sauce and the creme brulee at Gautreaux's in New Orleans. Mmmmmm. This sounds good, though dangerous. After reading The Elegance of the Hedgehog, though, I might stay away from Barbery for awhile just because her prose is so thick! I need a little break. As for my most favorite food experience, hmmm, I am not sure I have one I could single out and mention, although right now I am smitten by pho (Vietnamese noodle soup). The book sounds wonderful (and it would be so hard to read in the midst of a diet). Very sad that his relationships weren't better though. I had a dish once when I was a teenager at a buffet in Las Vegas, and it was so delicious that I ate about 5 helpings of it, but I was afraid to ask what it was (there was no label). I'm more adventurous with my eating now, but back then I ate mainly vegetarian food, and was grossed out by weird foods. The funny thing is that looking back as an adult, I'm pretty sure it was just a fancy crab salad. Which is ironic because that wouldn't have bothered me at all - I've always loved crab. I haven't been able to find anything like it since then though, which makes me wish I'd asked what it was. I'm a huge food lover so this book is for me! :D I plan to read Elegance of the Hedgehog first though. Have you read Elegance of the Hedgehog? I wasn't a fan, so I hesitate to read another by the same author. This sounds like a great book. Those Angels in Horseback sound yummy. For me, its all about comfort food. My grandmothers cooking always brings back fond memories. I love food but I can't remember a meal that is unforgettable. I'll pay more attention from now on.